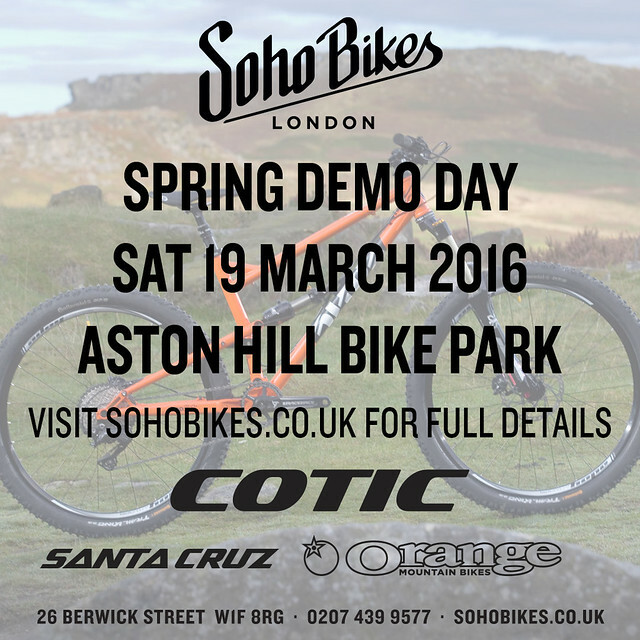 This Saturday, 19th March, we are doing our first demo of our new Demo Tour in conjunction with Soho Bikes at Aston Hill. Sam will be there with Rockets in all sizes, Souls in small and medium and a Solaris in medium. Plenty to go at, and Aston Hill is a great place to do a demo. Fun trails you can build into shortish loops to get in plenty of testing if you want to try out different bikes, or different sizes to get your fit just right. It's being run by Soho Bikes, so if you want to book out a Cotic, give them a call on 0207 439 9577. There's a £20 booking fee, but you get a free Soho Bikes T Shirt for that, and we'll give you that money back if you order a bike. Aston Hill is near Wendover, HP22 5NQ. You'll need to buy a £7 pass to ride if you're not a member, but it's well worth it. Cy's been down a few times and it's a great place to session the tracks and have fun on two wheels. Although you have to book on through Soho Bikes, if you have any questions about the demo bikes or what you'd like to ride, drop us a line and we'll take you through your options. Sam will be fully kitted out with all our bar and stem options, and variety of shock and build options on the bikes so you can see what we do, and try out what you're looking at. Remember to try and give us 10 minutes to swap things like bars and stems, and give a bit of time for proper set up before the rides if you can. The more time we can spend with you getting you comfortable and just right on the bike, the more likely you are to be able to fully appreciate how ace our bikes are! If you can't make it this weekend, don't forget to drop Sam an email about bringing the demo to you. Drop him a line on sam@cotic.co.uk with the bike you're interested in, where you are, when you ride (even mid-week night rides are good), and if you have any mates who might want to try a Cotic as well.